About the Author: Dr. Dailley is a practicing dentist specializing in curing bad breath. He founded the Center for Breath Treatment as well as NovaBay Pharmaceutical, a publicly held biopharmaceutical company. Dr. Dailley also offers a variety of oral care products and halitosis remedies online available for purchase including the best bad breath treatment kit. According to the American Dental Association, 75% of Americans have some form of periodontal disease. Gum disease is the number one cause of tooth loss in adults. Brushing twice a day and flossing daily is essential for good oral care, but there are places where your brush and floss don’t reach. This area of the gums is called subgingival and for most people, the plaque and bacteria that gets built-up there is only addressed with a visit to the dentist. Fortunately there are home-use products that allow you to clean this area. For patients, friends and family, I routinely recommend the Hydro Floss Oral Irrigator. What is a Hydro Floss Oral Irrigator? An oral irrigator is a handheld tool that allows you to apply water in a pressured, pulsating stream straight to the teeth. The stream cleans in between the teeth, on the surface and under the gums to areas where brushing and flossing don’t reach. The removal of this dental debris helps get rid of bad breath, improve gum health, and create a healthier oral environment. The Hydro Floss Oral Irrigator is an irrigator that uses hydromagnetic technology to remove tartar, plaque and bacteria built-up in your mouth. How does the Hydro Floss Oral Irrigator Work? Your teeth have positive ions on the surface and bacteria that enters your mouth has negative ions. Just as positive and negative magnets attract, bacteria is attracted to your mouth. The Hydro Floss Oral Irrigator is designed with a carefully calibrated magnet in the handle that changes the water’s polarity as it passes before hitting your teeth. 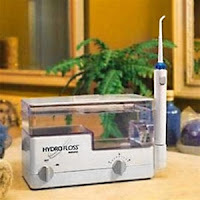 In this way, the Hydro Floss Oral Irrigator uses magnets and hydrodynamics to interrupt the bacteria-teeth attraction. Who should be Using the Hydro Floss Oral Irrigator? How is a Hydro Floss Oral Irrigator Used? The Hydro Floss Oral Irrigator is simple to use. Start by adding tap water to the 800 milliliter reservoir and placing it securely on the unit. Place one of the tips on the end of the corded irrigator. Adjust the settings to desired pressure level and plug in the unit. When you are ready, turn the switch to "on" on the front. Using the attached tip, direct the pulsating stream a quarter of an inch from the flat surface of each tooth. You should be able to irrigate all of your teeth with the single reservoir in about 2 minutes. How do I Care for my Hydro Floss Oral Irrigator? Make sure to empty and dry the reservoir after every use. At least once a week, you should remove the reservoir and wash it and the used tips with warm, soapy water. Once the reservoir has been cleaned, fill it up with regular water and run the unit without the tip. Repeat the last step a second time to ensure it is clean. When Should I Use the Hydro Floss Oral Irrigator? The Hydro Floss Oral Irrigator should be used on a daily basis. It is best to use the Hydro Floss Oral Irrigator in the evening before sleeping and after brushing and flossing. Should you need additional Hydro Floss Specialized Tips, you can purchase them separately. Which Pressure Setting Should I Start with? While the maximum setting of 60 psi has been proven to be completely safe for the gums, it is recommended to start with a setting of 5 and gradually increase the pressure level. Should the Hydro Floss Oral Irrigator Replace Brushing & Flossing? No. The Hydro Floss Oral Irrigator is meant to supplement your existing oral regimen. It is essential that you brush twice a day, floss at least once a day and visit the dentist every 6 months. About the Author: Dr. Anthony Dailley is received his dental degree from the University of the Pacific School of Dentistry. Dr. Dailley is a practicing dentist specializing in bad breath solutions and halitosis products. He also works with his patients offering products for dry mouth and teeth whitening products.